- 800 souls blacksmith in Majula (10 pieces). - McDuff at the hem (infinity). - Girl in the valley entrance harvest (infinity). - Blacksmith's Daughter (one piece). If you have advanced in the game and want to change gender of your character, go to the small beach which has two ogres, just after Betwixt Things. Behind the ogres there half open coffin. Sign in and you change gender. 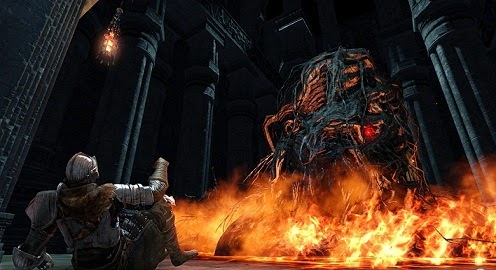 This version of Dark Souls II has changed the location of enemies and items, so that experienced players in the original can be a bit lost, all is not as it reminded. You can find the bug titanite in the Forest of fallen giants, right where you find Melentia. Lost Bastille Tracker also lets drop some titanite. After winning the boss in the Forest of fallen giants, you will come to the first bonfire Lost Bastille. There you will find two chests, is one. Kill Puff the Magic Dragon in Heide tower and get this object. No longer in Belfry. Now you can found near campfire on the premises of the servants (Servant Quarters).